I like totally target on facebook! Thanks!!! Woot Woot!! I love Target!! And I already “like” totally target! It would be great to win something. oh bullseye <3 totally target! Thanks for another great giveaway! Happy Easter! TT is always “liked” on FB!! I would like that gift card! shoot that gift card over to me! I would love to win. Easter Blessings to you and your readers. Wishing everyone a Happy Easter!! Thanks for all your hard work!! I like you on Facebook!! THANKS!! HAPPY EASTER!! I would love to win! Have a good Easter! Happy Easter! Thank for the chance to win. Love giveaways, thanks for your hard work. Hi, Happy Easter! thank you for a great giveaway! Thanks for the chance and all that you do. You rock! 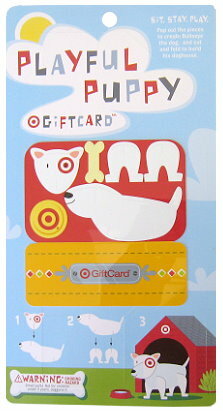 Puppy gift card! How cute! Happy Easter! I hope I win!